I am a member of my daughter's school's PTO and I do volunteer my time as I can. My daughter's teacher also solicits volunteers for a number of events throughout the school year. What I found different about Georgia schools versus Indiana schools are the amount of volunteers they seek to help not only for the PTO but in the classroom. I think it's an excellent source of donated help that increases the quality of education. The first day I signed my daughter up for school, I was in shock as they didn't charge fees or book rental. My entire life in Indiana both with myself and my oldest always dealt with high fees associated with attending school. Georgia does not charge this which was a complete surprise. Given that and knowing how the PTO relies so heavily on events to get donations, I felt obligated to step up to the plate. Our fearless PTO leader, Teri, is a motivational, fun and inviting person so that helps! Because I do work, it's really hard to be able to reach out to the classroom as I would like. Every event is for the day hours which conflicts with my work schedule. I often see e-mail requests or paper requests seeking help and when TwitterMoms partnered with Jooners, I thought this would be a great idea for my daughter's school or any event that seeks volunteers. Tracking Volunteers: One of the hardest aspects of volunteering or organizing an event is tracking the volunteers. 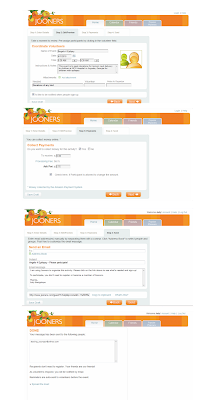 Jooners is a time saver for all because it allows an updated sign up sheet 24/7 with no manual tracking of volunteers needed. Anyone who has ever organized knows that it's trying just keeping track of who has volunteered and for what. I love this aspect of an easy, one stop shop for all that allows me to stay up to date on the event and it confirms what I'm volunteering for. Numerous Notifications: e-mail traffic can become cumbersome when there are multiple changes and updates to an event. I keep separate folders for certain e-mails to allow better organization but again with Jooners, it's easy peasy! Organizing! This part can be a nightmare if you are the one to organize the event! Trying to craft the flyer just right or the e-mail can take time but if you have a tool such as Jooners, it's an easy four step process to create, send and track. Donations: An easier way to donate would be nice as well. With Jooners, the organizer can set up the events and seek donations online via Amazon. I set up a trial one for my daughter's Angels4Epilepsy project just to test it out and it literally took four steps for Jooners. There were additional steps to set up my Amazon account but it was all very easy. To have one place to not only sign up but to provide a donation would definitely save time and hassle. Time: Having the time to donate time or money is always an issue. The one stop place to see everything in one place would make volunteering easy. Volunteers gain free access to the event they were invited to and while you are there, you can add anything else that might conflict to your activity thus making it easier to volunteer. Overall, my post was originally going to go in one direction focusing on volunteering and making it easier but it quickly turned into an endorsement for Jooners. As a person involved in the PTO maintaining the PTO website and volunteering for other events, I see such great benefits from this service. It does cost but it's only $19.95 a year. If you are an organizer, you should check out the 30 day free trial. If you aren't and know of an organizer, you should tell them about it. 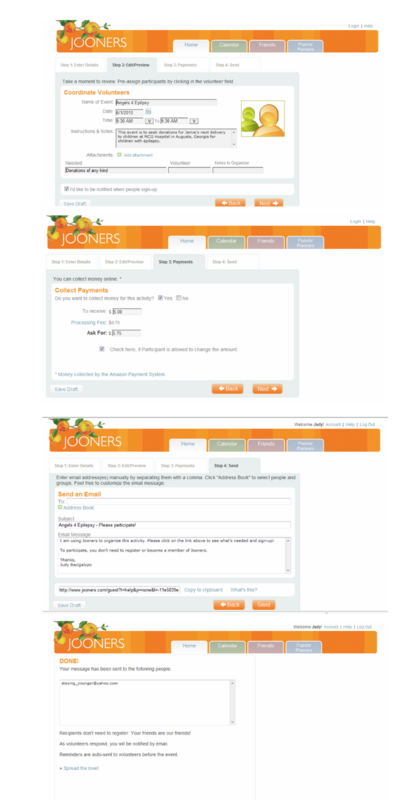 Don't forget that Jooners is suitable for any event to include family reunions, book clubs, garage sales and so much more. The one thing that would be wonderful for volunteering is to have volunteers because I am the PTA and it is driving me crazy.